This siding can withstand harsh weather like no other. It has an approximate wind sustenance rate of 240 mph, making it an easy choice for diverse climates. Our Mastic siding in Lincoln, NE, is also easy to maintain, hardly requiring more than a simple wash down every now and then. Insulated – This siding provides natural beauty to your home, while boosting its insulation value. Lap – Clean and simple linear designs that are available in multiple wood grain or smooth finishes. Vertical – An excellent choice for entryways, low porch walls, gables and dormers, due to its intricate pattern of vertical lines. Shakes and Shingles –Boast the classic wood shakes and shingles, without the hassles associated with real wood. Our Mastic siding comes with a number of accessories for a well-defined curb appeal. They include soffits, trims, and fascia, all in matching colors. Our siding also comes with a manufacturer’s lifetime warranty for your peace of mind. Quest vinyl siding from Mastic by Ply Gem® is one of the most sough-after siding solutions on the market today. It comes in an array of aesthetic styles with incredible features to withstand different weather conditions for years. Double 4” – It’s the perfect choice if you desire the unmistakable charm of wood clapboard siding. It offers realistic shadow lines, creating an illusion that the panels actually overlap. Available in a bevy of exterior colors, it’s the ultimate choice for traditional homes. Double 4.5” Dutch Lap – This option features truly overlapping panels with a shiplap joint. It has a distinctive flat face and cove, offering a narrower reveal line for greater visual interest. Its decorative groove enhances strength and lends your home deeper shadow lines. Unlike most Quest lap siding options, this type of vinyl siding in Lincoln, NE, comes in both gorgeous solid hues and lovely cedar woodgrain finishes. Double 5” – It’s a step up from the Double 4”. It features the winning qualities of its smaller variation, only it offers a stronger shadow line. You can rely on both the Double 4” and Double 4.5” Dutch Lap options for durability. They come with Hang-Tough™ Technology, making their panels resist impact, cracking, and thermal distortion under extreme temperature swings. They can also withstand wind speeds up to 240 mph. You can also request this siding in longer lengths for a nearly seamless look. Thanks to the Duranyl 5000® Protection System, these types of siding, retain their vivid color against the harshest of elements. They deliver exceptional weatherability and never require painting. Quest lap siding is also environmentally friendly. They’re crafted from readily available materials, minimizing the depletion of scarce natural resources. You can also have them recycled after the end of their service life. This way, you can reduce landfill waste. 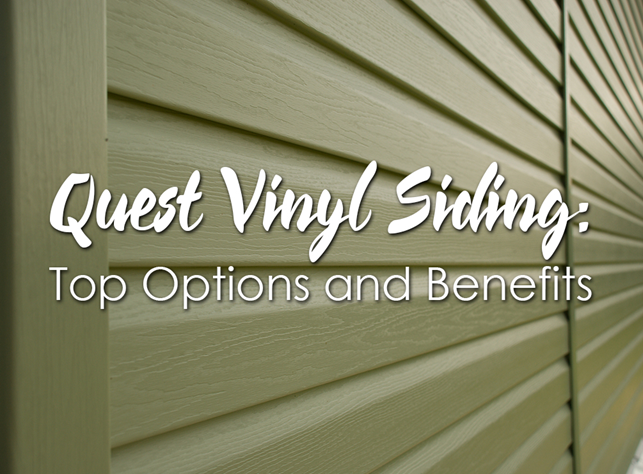 Let Nelson Contracting help you choose the best Quest vinyl siding solution for your home. Call (402) 464-2418 now for your repair and replacement needs. We’ll be happy to give you a free estimate. We can install this premium brand siding on your home today. We are your trusted local contractors. We strive to provide you with the most satisfying experience as we exceed your expectations for your project. Call us now at (402)641-5277 to discuss your siding needs. You can also fill out our request form and we’ll contact you shortly.